Netflix (S NFLX) wants to bring its streaming service to set-top boxes leased by U.S. pay TV operators this quarter, the company announced Monday. In its first-quarter letter to shareholders, the company announced that it will first launch on TiVo (S TIVO set-top boxes leased by operators in the U.S., which is similar to agreements the company struck in Europe. Netflix also said that it will “try to extend to non-TiVo devices” after rolling out on TiVo boxes. In Sweden, Netflix partnered with Com-Hem earlier this year to make its service available to pay TV subscribers. Com-Hem customers can access Netflix through the TiVo box they’re leasing from the operator, where the service will be listed alongside traditional cable channels in the channel grid. Netflix CEO Reed Hastings said during the company’s earnings call Monday that the integration with U.S. operators would at launch not include any billing services, but that consumers could potentially also directly pay their Netflix subscription through their cable bill. 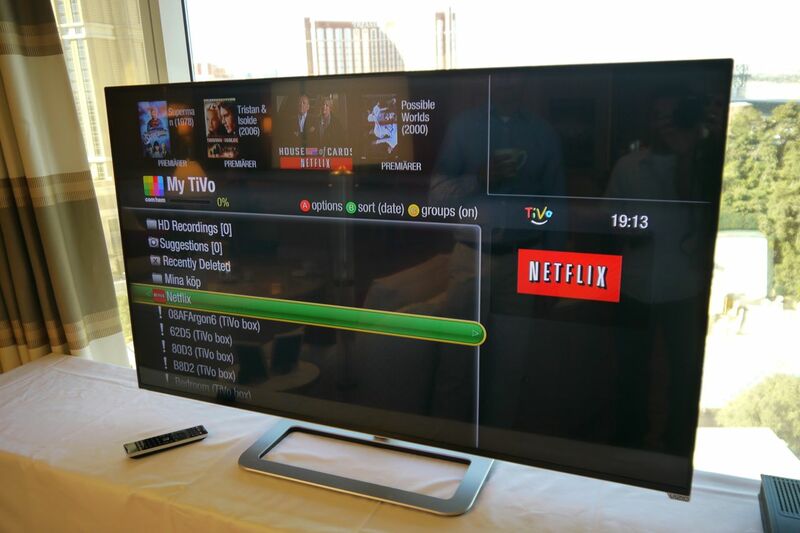 A Com Hem TiVo featuring the Netflix app, as shown at CES 2014 in Las Vegas. Netflix wants to unveil similar partnerships with other operators this year. Netflix has struck similar agreements with Virgin in the U.K. as well as Denmark’s Waoo. In the U.S., the company could previously not enter similar partnerships because of restrictions in its contracts with Hollywood studios, but Netflix CEO Reed Hastings said earlier this year that those contracts have since been renegotiated. Netflix didn’t identify the U.S. operators it is partnering with Monday, but U.S. operators that already offer TiVo devices include RCN as well as Suddenlink. Both operators are also already Netflix partners, and use the company’s OpenConnect content delivery system. Also Canada. Put Rogers in their place by partnering with Cogeco and Shaw! Awesome : Please come to Florida no more bright house or dish or com cast bright house has been screwing people for years ! Netflix kick there gluteus maximum .